The Boomerang Bags program was started in Australia in 2013. Minneapolis Climate Action brought the program to the U.S. in 2017 and is now the U.S. headquarters! The Boomerang Bags movement is a network of local volunteers who work independently to reduce waste in their communities. Donated fabrics diverted from landfills are sewn by volunteers into beautiful and unique reusable bags. These bags are distributed to the public who are encouraged to "borrow & bring back." These bags cut down on the need for single-use plastic and paper, uneconomical and wasteful options for our communities. 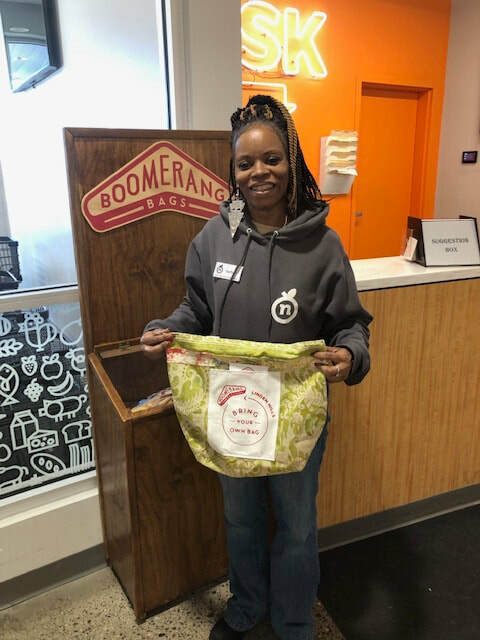 Our Boomerang Bags bin at North Market in North Minneapolis! Our "Sewing Bees" are held on the third Saturday of every month. Please contact us below if you are interested in attending. We'll provide the snacks. While we have some sewing machines available, please bring your own machine if you want to sew. If not, don't worry. Feel free to bring an iron, scissors, fabric, or just yourself! All are welcome. We sincerely appreciate fabric donations, including reusable bags. Join our Facebook group to connect and get event updates and news. Please spread the word by sharing our Facebook event and bring anyone who might be interested. Please RSVP below. Even if you can't make it, we'll add you to our email reminder for next time. Enter the glass door to the right of Wild Rumpus, climb stairs to landing, and enter the door on the left. We'll have a sign welcoming you. Stay for as little or as long as you can! Handicapped accessible elevator is available at the rear of the building, just ring the buzzer.